Wonderful newly renovated (May 2016) apartment in an old mansion overlooking the river "The Leie" and the stately courthouse. In the historic city center, close to many cozy restaurants, the main shopping street, the main city highlights and the idyllic "Graslei". There is one large bedroom with king-size box spring and a large sofa bed in the living room, a bathroom with bath / shower, an authentic double sink and toilet. The spacious living room has a sofa, WiFi, flat screen TV with chromecast, Radio/CD player with bluetooth, table with chairs, etc .... The apartment has a comfortable kitchen with Nespresso coffee machine, kettle, oven, microwave and ceramic hob. Your apartment is totally private. Great space convenient to the local sights and shopping. Directions were a little tricky. But it was probably just my interpretation of the directions. Parking however was not good at all, expensive.......when parked under in Kouter, it was very difficult to drive from the parking to the apartment. 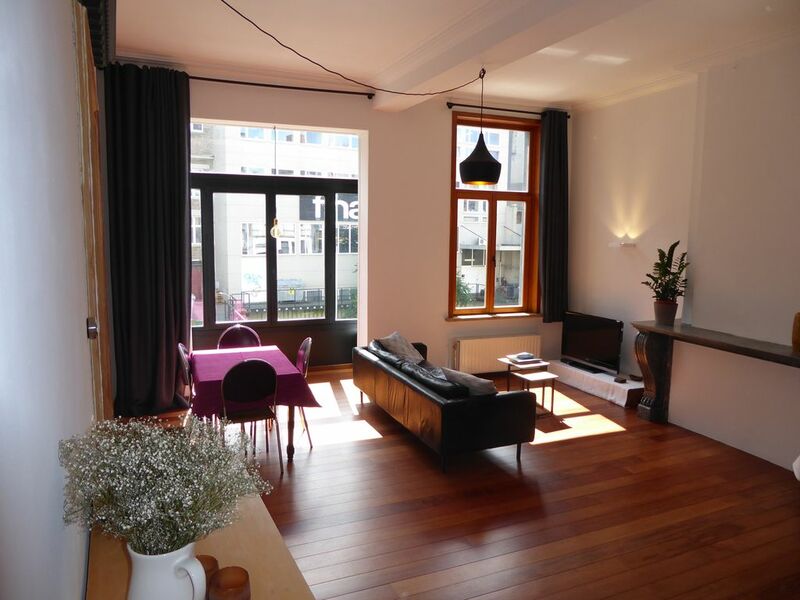 My husband and I spent 5 days in this charming apartment, our first time visiting Belgium. Its central location with the river view and proximity to restaurants, shopping, and the unparalled Ghent public transportation is stellar. The apartment is spacious, sparkling clean, and well-appointed with a very comfortable bed. Bathroom has double sinks, an unusual feature in many rental locations. All email correspondence with Marieke the owner, was informative and prompt. She also provides many helpful tourist resources and recommendations. Our stay could not have been more delightful! This apartment is deserving of our highest recommendation to everyone! Beautiful, sunny flat! Very comfy! The flat is so GORGEOUS and in a great location. We made use of the kitchen and slept well at night. A very comfy option for Gent. Highly recommend!! We loved this space! It was so cozy and the bed was the most comfortable of all the VRBO's we have stayed in. The location was great for getting around and the parade of people, bikes and boat's out our window was so fun to watch. We couldn't believe how quiet it was with all the activity outside. There is so much energy in this town that I hope to return one day and stay longer in the apartment.